ELLENTON, Fla., (Oct. 9, 2018) – Feld Entertainment, Inc., announced today a new brand identity ahead of the 2019 Monster Energy AMA Supercross, an FIM World Championship, season. On the heels of the 10th anniversary of Feld’s purchase of the motorsports division, which changed the course of the global brands, ®Monster Jam and Supercross, and led to extraordinary growth in a time with traditional sports have struggled with attendance and TV ratings, the refreshed logo and identity system reflect what Supercross is today and symbolizes its future. New in 2019, fans will expereince the pre-race FanFest, an even more festival-like atmosphere spanning 14 acres that opens at noon on race day. 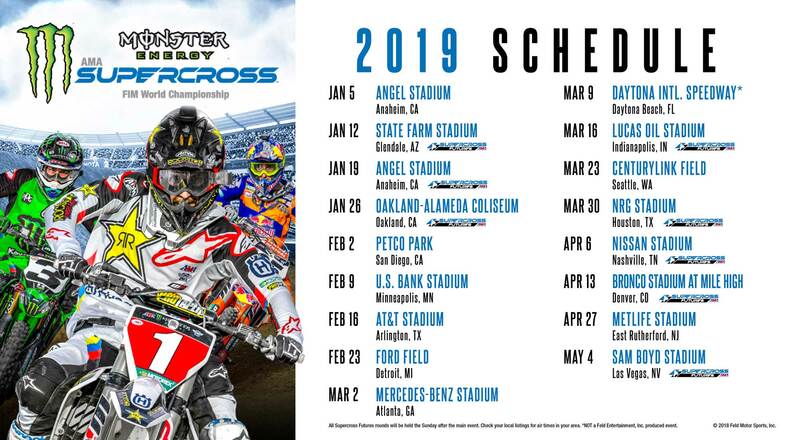 FanFest has something for every fan with live music, experiential activations, autograph sessions plus a Supercross Virtual reality experience while allowing fans in-and-out access to the track to watch practice and qualifying.